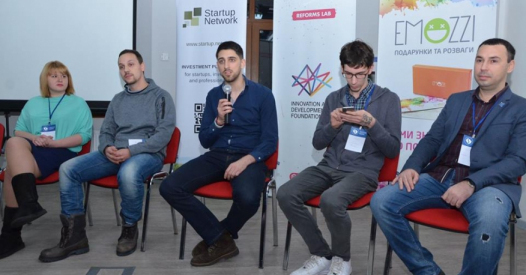 The 64th Startup Battle, which took place in Kiev on November 17th, was not just an investment battle, but an epic challenge of wits between Intellectuals, as the event was devoted to the topic of startups from the fields of: Blockchain, Cryptocurrency, Artificial Intelligence and Chatbots. Within the framework of the Battle, a discussion of crypto-brains took place, in which Svetlana Malevannaya, Kir Kelevra, Sergei Skabelkin, Anatoly Kaplan, and Oleg Kudrenko partook, while Andrei Veliky moderated the lively discussion panel. I look at these people and I have tears in my eyes, because I understand that they won’t see their money anymore. The first thing I would like to talk about, is that the industry of cryptocurrencies is developing very crudely, and people still do not understand it fully. This is used by scammers, drawing them into questionable scams, schemes and pyramids. It seems to me that today this is an actual problem and I would like to begin with it. A question to the experts: from your point of view, what’s the simplest way to evaluate a real project from a "rip-off"? Oleg: For me, the big red flag that this is a pyramid or a “rip-off” (like Onecoin), is a very strong referral system and the promise of fabulous percentage. If you’re promised big awesome-awesome percents, most likely it’s going to be 99.9% certain, you will lose your money. Because such structures pay the percent at the exit point, that is until they gain a critical mass, everything goes honestly. It may be a month or a year, but at some point a decision is made to stop the project, and people lose all the money. If they make a money crypt, they’ll lose them without any possibility of a return. Kir: Onecoin has a "coin" in its root, but I like the person who understands that in crypto-currencies, I want to say the following: today there are about five or six thousand crypts, more or less live ones around 750. Everyone can create their own crypto currency, because that this is open source. We need to understand, that from 750 to 6000, crypto-currencies, are either projects that have already died, or they were originally created to as a scam. Onecoin, in fact, is not even a cryptocurrency, because there is no cryptocurrency component. Scammers do not rest, they go on and start connecting smart contracts here and thinking that some proximity to Blockchain technology will help them capture more trust. There is one very positive effect from all of this: they’re engaged in the dissemination of cryptography and thereby the popularization of cryptocurrencies. People, at least, will find out about it. Andrei: If you want to invest money in something that you think is a cryptocurrency, just write to one of us on facebook. We’re able to drop a minute of our time to shoot you an answer, "yes, this is a real project", or "no, it's a rip-off." Anatoly: My colleagues advise to seek out help from opinion leaders Ask. Be interested. I'll tell you - do not just trust anyone! If you don’t understand the object of investing, do what you know. That’s because the cook should cook, the driver, well drive the car, and the journalist should write. You have come to some expert you see for the first time in your life, he doesn’t have any guarantees for you that he’s not bribed or interested in misleading you. So until you get it figured out on your own , keep money somewhere else. Sergei: I want to take the matter a little further. You must understand that all the modern monetary units that you use in monetary circulation, they are inherently pyramids. Yes, in the scam you are promised some incomprehensible income, and at any time can check it., The Know that the State cannot, at any time, give up its obligations or could include an annual inflation tax of your costs? You should understand that the modern financial system is a by nature unfair to the end user. It’s very important. What lies at the basis, is the technology itself. It is really unique and conceals in itself a tremendous source of opportunities, and it really needs to be closely watched. When you see some projects that seem to you “investment-attractive”, look at them from the point of view of the technology that lies at its basis, in terms of the potential to become a unicorn and change the world. Unfortunately 99.9% of the projects are potential scams, and therefore, say good-bye in advance to the money that you want to throw in there. Andrei: Since we have already started talking about the specifics of investing in crypto projects, let's take a closer look at this issue. Kir: About the features of investing, I would like to say the following - almost all of them, if they have some potential, an idea, a business model or a team, will grow in value. The most reliable principle for investing in cryptocurrencies today is "buy&hold". Sergei: If we are talking about investing in an already formed project, that’s is one thing, and here I fully support Cyril. If you talk about investing in startups, then do not forget about DAO and about all sorts of projects that you have the full right to invest in, without violating local legislation, using certain crypto assets and, in fact, buying their rights to future products, technologies, and so on. . Here too, exactly: if you took the risk of investing 10-15% of your income in a project, then this would be a fully justified investment, despite the scandals that were associated with it in 2016. This market, unfortunately, is very risky and has a large number of people who want to make profits from it. You just need mentally prep yourself to the fact that this is not classical banking, where you brought your savings at 24% and then you were paid in full. Here this will not happen. If you are nipped, then no one will return a single red cent, be ready for this. Here I want to add - invest, and don’t be afraid. It’s really interesting! The last question that I want to put on the agenda today, continued Andrei Veliky, is the one of legalization. Svetlana: If you want to create a stock exchange or some business that will bring you income, sooner or later it will become necessary to come back to the issue of legalization. But I beg you, don’t rush to this. Because if once you start advertising your crypto business as legal, create a corporate structure, start opening bank accounts, and then you realize that in fact it was necessary to organize this business in a completely different manner, it will be very difficult to undo. First, understand and clearly identify the critical moment when you need to register and legalize a business. Andrey: If we have a classic startup, we’re going to the Valley and raise some sane rounds. We'll still come to the point that we need jurisdiction where we can register a startup related to cryptomatics. If we issue some kind of Token and go to the stock exchange, they still need to be equal to the shares of the company in order to properly pay dividends. In general, we’ll have to come up with something. However, in the beginning, really, it's better not to rush. Svetlana: And one more tip: if you need to address lawyers with questions related to crypto-technologies, consult those who work in fintech and intellectual property, because very often many decisions are at the junction of these spheres. There are various other options, as it’s possible, to leave but in other way to beat this business. If you put everything correctly in place, for example, as a platform that provides opportunities for users to make some kind of exchanges, accordingly, you do not need to get a license, and you can completely and legally withdraw from the business associated with cryptocurrency - you do not buy or sell, you are just a technical platform. In this vein, it is entirely to formalize a business. Kir: I would like to diverge from the theory, and say that now this issue is really quite urgent. Jurisdictions that somehow support the work of some cryptocurrency projects are already there. With that said,, under the laws of the country which you will then be operating. - let's move away from this topic. In Ukraine, there’s an excellent range, because there’s no regulation of this industry. You can create a product from A to Z and only then legalize taking into account the legislation that already exists or not. Sergei: There really is a small, but important philosophical question. Unfortunately, everyone is now measuring the cost of bitcoin by the dollar. That means that a dollar is of value to you. You believe Obama, Trump, but you do not believe in bitcoin. You consider it an investment asset whose value is measured in dollars. Now I ask, how much is your car, or apartment? Can you tell me the price in bitcoins or in hryvnia? 100% it’s in dollars. So, when one of you creates such a cryptoactivity, which becomes at least for a small community a unit of value, when they begin to measure their values ​​in this cryptocoins, you will be billionaires.